I’m sure the original First Nations population of British Columbia would have been appalled, or at least confused by the throngs of tourists snapping photos and taking videos of the assembled collection of Totem Poles in the park. The other option for seeing Totem Poles and other collections of First Nations art is not free, but without the tour buses. Approximately 20 minutes from downtown Vancouver, and an interesting drive through the suburban area of south Vancouver, is a quieter and reserved observation of the creations of the First Nations peoples. 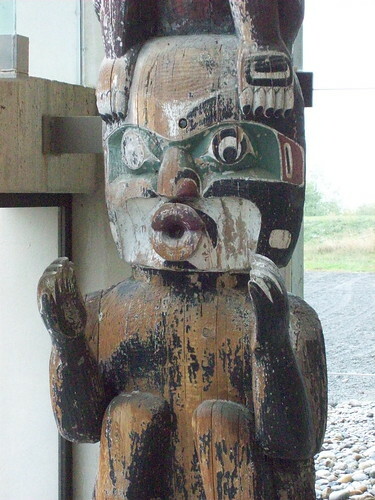 A large collection of over 35,000 artifacts are housed at the Museum of Anthropology (MOA) located on the campus of the University of British Columbia. Today’s building is far more complex than its humble beginnings in 1949 in the basement of the University Library. The current museum was designed and built in 1976, holding collections of not only First Nations artifacts, but that of the South Pacific, Asia, Africa, Europe and the Americas. 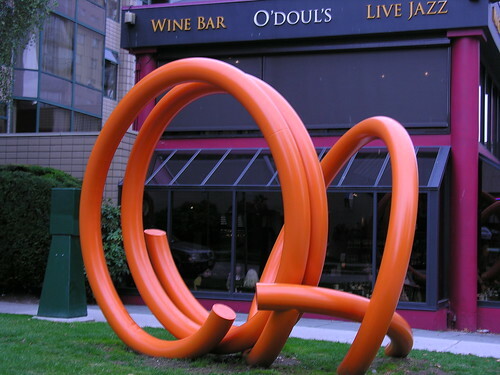 Most well-known for its Northwest Coast collections, the MOA exhibits large sculptures in the Great Hall. These large wooden sculptures of red cedar are representative of several First Nations communities such as the Haida, Kwakwaka’wakw, and Oweekeno. "Really guys! The fish was THAT big!" Every once in a while, you might have the opportunity to savor a really fine, skillfully prepared, exquisitely tasteful meal. I had that incredible experience at a hotel restaurant named Zin in Vancouver, British Columbia.With an advertised “$2 Bites” and some coupons handed to us for wine sampling, we ventured into Zin, not knowing what we’d discover. What we encountered was incredible. In our downtown hotel location on Robson Street, there are shops (like Guess, Banana Republic, Tommy Hilfiger) with upscale names and glamorous window displays. The prices were glamorous, too, except for a modest Chinese Restaurant, Hon’s Wun-Tun House, which whipped out our food very quickly for takeout. The menu was enormous and we had a hard time choosing, but the prices were generally under the $10 (Canadian) price range for each entrée. In contrast, we spent considerably more – $40-plus with tip – at O’Doul’s (Listel Hotel) for a corned beef hash and Eggs Benedict breakfast.